PADI (Junior) Open Water Divers who are at least 12 years old. Actually Nitrox is a shallow gas not a deep gas. The primary purpose for breathing enriched air Nitrox is to increase your bottom time at shallower depths. Nitrox 32% have a maximum operating depth of 110 feet and Nitrox 36% has a maximum operating depth of 90 feet. I Need Special Equipment to Dive Nitrox No. Most scuba equipment made over the last 5 to 7 years is Nitrox compatible up to 40%. With the older equipment usually is as simple as changing a few offerings to make it Nitrox compatible. The classroom portion of the class last about 3 hours. The PADI Enriched Air Diver Crewpak. The crewpak includes Package includes EANX Manual (required), DVD (required viewing), EANX 32%, 36% and O2 Equivalent Air Depth Tables (all required) and the Enriched Air Tables Study Guide and Instructions for Use. The web-based system covers all the enriched air diver course content and allows you to study at your own pace through an easy-to-use, interactive program. You also have access to an online version of the Enriched Air Diver Manual..
Get Your PADI Enriched Air (Nitrox) Diver Certification Today. During the Enriched Air (Nitrox) course you will learn how to properly select the best mix for your dive through some simple calculations for the proper mix. You'll also learn how to use your enriched air, equivalent air depth and oxygen exposure tables to plan your dive. Finally you will learn how to properly label your tank, calibrate and use an oxygen analyzer to verify your mix. Four computer divers you will learn how to set your dive computers to the proper mix. You will also have to set and confirm your dive computers partial pressure settings. Once you are familiar with your dive computers operation and how to set the proper mix and partial pressure you will be ready to start planning a dive. Most dive computers will have an onboard dive planning mode which will tell you your maximum bottom time and depth for any given mix. You begin the academics in the comfort of your own home. Once you sign up for the course, you will receive all the academic materials needed to complete the home study portion of your course. 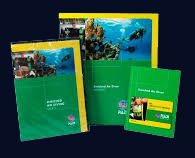 To start your course you will watch The PADI Enriched Air (Nitrox) Diver course video and complete your knowledge reviews in your PADI Enriched Air (Nitrox) Diver Manual. This will get you ready for Your classroom session. The PADI online academics program is great for students who are short on time. Bypass the classroom with the PADI online academics system. You will complete all of your academics in the comfort of your own home at your own pace. 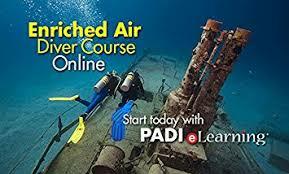 Step one: Log onto the PADI online system and complete your online academics. Step two: During the classes scheduled classroom academic session. You will come into the shop and under the direct supervision of your PADI instructor and take a quiz that will verify you have completed your online academics. There are additional costs associated with the PADI online academic program. The cost is $179 per person and is not included in our standard or group courses. Note: online academics is not available for ages 12 and under. For the PADI Enriched Air (Nitrox) course there are no training dives required. Most students will take this course as soon as they become open water divers or they will take a right before doing their advanced open water diver course in order to be able to extend their bottom time on their deeper dives. If you would like to add training dives to your PADI Enriched Air (Nitrox) course you may do so when you sign up for the course. Just select additional training dives. It is deftly not mandatory however you should consider having your own oxygen analyzer if you're going to be in Enriched Air (Nitrox) diver.